Ah, electricity. This is the modern day man’s version of fire, and if there ever was a blackout for a prolonged period of time, you can be darn sure that people are going to be extremely upset. After all, how else are they going to get the kind of juice required to power their mobile devices such as smartphones and tablets? Of course, not to mention the fact that electricity is required in order for your Internet router to work so that you can remain connected to the rest of the world. Thankfully, blackouts and brownouts are not too common at all these days in developed countries, but even then, there are times when you would like to have something powered out in the open. What do you do then? Enter the $29.99 Power Strip Extension Cord Dome. 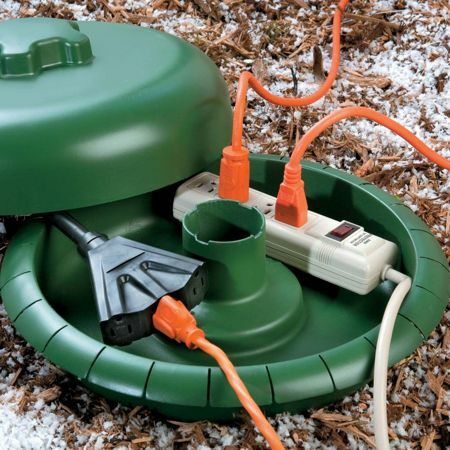 The Power Strip Extension Cord Dome ensures that regardless of what the outdoor weather is like, and how threatening it might be, it will not be able to be a wet blanket on your holiday lighting plans, or any other kind of situations where outdoor power is required. No longer do you need to rely on the ugly looking method of wrapping plugs using tape or plastic, you are now able to keep multiple connections protected outdoors with the Cord Dome. Using it is but a snap – just place your power strip within, plug in all of your relevant cords, screw on the lid, and come rain or snow, it will work like a charm.